This blog no longer supports David Madore and calls upon him to resign immediately! I have now heard from two different people that successful Vancouver businessman, owner and CEO of US Digital, David Madore will challenge Marc Boldt for his County Commission seat in this years election. 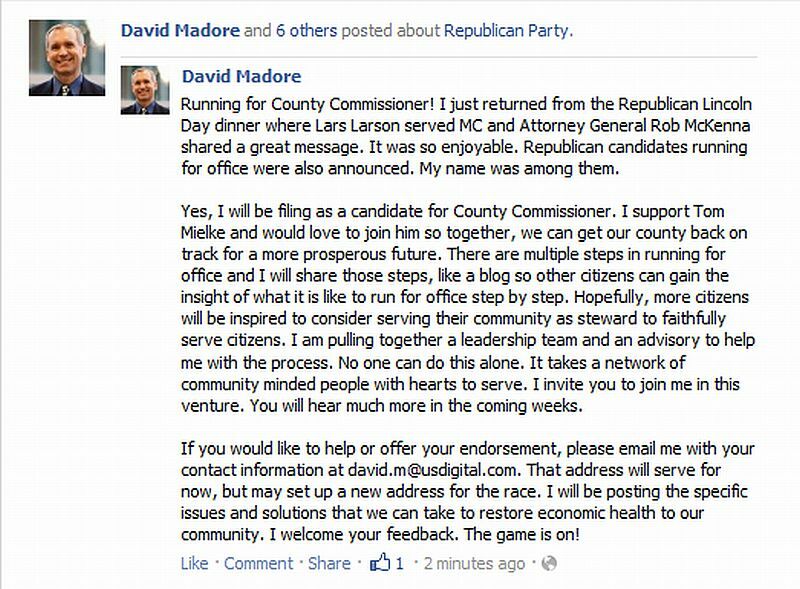 While no formal written announcement has been made, Mr. Madore is said to have made a public announcement at the Clark County GOP Lincoln Day Dinner. It’s long past time we had a real conservative occupy Marc Boldt’s seat. It’s about time Boldt must go at any cost! David, I wish you well. I guess Lew, Kelly, I and several others have seen the back side of pit of the local scoundrels and have continuous fun with them. I hope you win because with two on the council, Steve will be finally cornered. And I can hardly wait to see how Steve is going to deal with being outnumbered! Gosh, this is been the FUNNEST local race in about 10 years for me!!!!! Madore’s probably the only one who has a chance of pulling this off. Boldt will indeed get all the Democratic vote, plus he has a tremendous amount of name recognition and has built up a constituency. Most folks consider him a moderate, and he DID vote down that despicable baseball scam. Martin, it is fairly well known that Boldt probably went against the admissions tax at the last minute in part due to sanctions being placed on him by the Clark COP, for his many times of voting against what the party platform stands for. It will sure be an interesting race! Boldt was approachable and really showed concerns, but his vote was easily swayed by Stuart, who was unapproachable and always talked down to people, especially if you were not lockstepping to his political agenda. Its no wonder Stuart almost lost to an unknown in the last election. Stuart does the same thing to me and I’ve got 2 doctorates and am an attorney. (He didn’t pass the Bar.) That’s the guy that needs to go. How did the Republicans let him get away last time? The results in the general were much closer than would be expected, given Alan Svehaug was relatively unknown and Stuart is well known. 51.21% for Stuart to 48.64% to Svehaug is pretty close. Then too, Stuart did campaign on promising a vote on CRC & Light Rail, didn’t he? David is a fine candidate and is just what we need in the race. We need to get more candidates like David and just maybe we can get these Elitist bastards out of office before they totally wreck the place. Good luck to David. Running for office is not an easy thing. How’d the GOP not take out Stuart? Well, Boldt endorsed Stuart, for one thing. 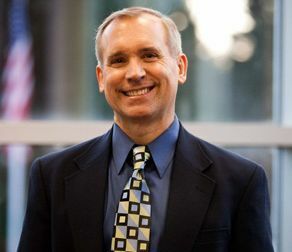 David Madore’s announcement that he is entering the race for Clark County Commissioner to challenge Marc Boldt should be received as great news by our citizens. With unemployment at nearly 20%, we need successful private sector business leaders like David who have vision and the experience to bring businesses to Clark County. Mr. Madore’s reasons for entering this race are admirable. Watching current Commissioner Marc Boldt move farther into the “never enough taxes for more and more government” voting record over the past years has been extremely disappointing to those of us who believe in fiscal discipline and leaner government while taking care of the most vulnerable. Mador not only knows how to start and run a successful business in difficult economic times, he employs people and gives to dozens of charities all around our community. He has a high regard for the citizens and believes they should have a voice in their own destiny. He listens, is respectful and keeps his promises. He is a candidate that is willing to sacrifice his time and effort to help our County get back on track, by creating an enviorment that will encourage businesses to come to Clark County and help existing struggling businesses and new businesses prosper. Commission Boldt has become openly disinterested in the will of the voters. He has stonewalled a vote on light rail, all the while our Congresswoman Jaime Herrera-Beutler fights valiantly for it on the house floor in Washington DC. He has aligned himself a large percentage of the time with his liberal counterpart on the Democrat side and has left Tom Mielke, the only fiscal conservative voice on the Board alone to fight for the rights of the taxpayers. Special interest groups who reap benefits from proping up failed Clark County government projects while rail against Mr. Madore because they know he will be looking out for us and the gravey train will be over. Don’t be fooled by their wailing. It’s time for proven, successful leadership with a proven track record of making sound business decisions along with a compassionate heart to be in charge. That is David Madore. I guess Lou and John will need to sharpen their knives again. The powers that be in Clark County will not be pleased if David Madore wins. I wish Stuart were running this year. I’d rather see him gone than Boldt. Boldt may indeed be sniffing the glue, but Stuart’s even worse. Oh well, Mielke and Madore should be able to contain him I suppose. I’m quite sure that The Columbian already had their knives “sharp”. The Elitist bastards knew Madore was going to run for something long ago, that’s why they started attacking him right after he appeared on the scene. I want to see bumper stickers that say: ” Clark County’s Worst Enemy Is The Columbian” driving around. I think I’ll have some printed up. My immediate question is when did the Columbian learn about the sanction – if they knew of it a few weeks ago, why hold off publishing it until now? I don’t know when they knew about it, but I had a post that I never put up ripping Boldt to pieces over his pro-Democrat conduct. I have no idea if they knew previously or not. Brandon Vick was surprised to find out I knew about it back then as it was supposed to be kept under wraps in hopes of bringing Marc back to the fold, so to speak. Boldt was obviously acting like a Democrat and deserved to be sanctioned. The Columbian is just trying to pull off another “hatchet-job”, that’s all.